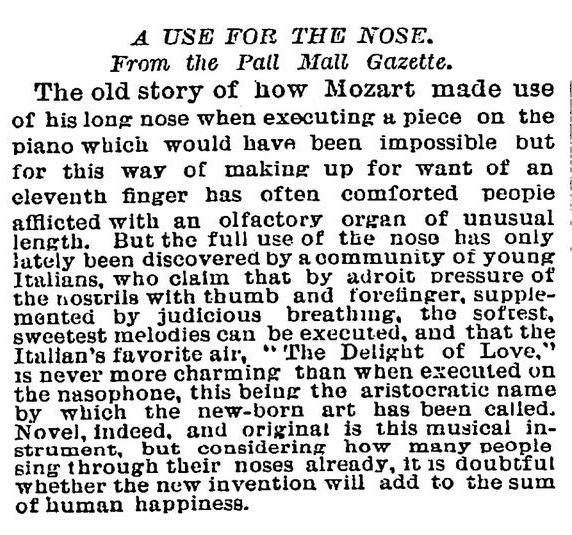 The Nasophone: An Unexpected, Musical Use for the Nose? I suspect that the following old newspaper excerpt is a joke, and a fun one at that, but one can never be too certain! One thing I do know is that the opening remarks about Mozart seem to be based on an anecdote that I’ve heard before. Scroll down below the picture to read more about this. One day, Mozart taunted Haydn that the latter would never be able to play a piece which Mozart had just written. Haydn sat at the harpsichord, began to play from the manuscript, then stopped abruptly. There was a note in the center of the keyboard while the right hand was playing in high treble and the left hand in low bass. “Nobody can play this with only two hands,” Haydn exclaimed. “I can,” Mozart said quietly. When he reached the debated portion of his composition, he bent over and struck the central note with his nose.